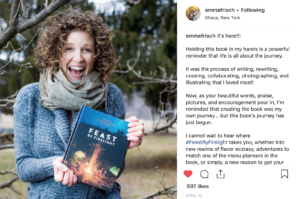 It was in early February of 2018 that I received an exciting (and top secret) message from Ms. Emma Frisch, owner of our local glamping retreat, Firelight Camps , and author of of the cookbook, Feast by Firelight. We set up a date to chat shortly afterwards, and there we began our 9 month long project. A time lapse portrait series to document her second journey through pregnancy. Every two weeks we met both outdoors and in my studio space to capture a fine art style portrait of her growing figure. After a few weeks of trial and error, we decided on a handful of poses and clothing options that we felt would work best, and we stuck to them. Each time I met with Emma, she would stand in the same spot in my studio, with the same radiant smile, and I’d feel so much joy in my heart watching her growing glow. 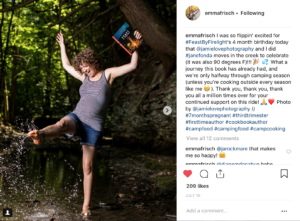 During this time, Emma also gave birth to her new cookbook, Feast By Firelight which is a collection of campfire cuisine recipes designed to inspire a whole new level of what it means to cook while camping. (no lame hotdogs on sticks here) We also set aside some time to capture images that would coincide with her book launch. 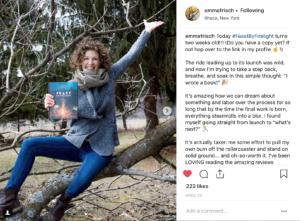 Growing a new baby with a toddler in tow, AND launching a best selling cookbook is a rather super human power, its such a tornado of creativity, hormones all rolled into one. I’d like to take a moment to give her my deepest and sincerest bow. Too often in the whirlwind of motherhood, we can loose site of our sense of self, and forgo our own personal career goals, and creativity. Emma, did quite the opposite. Her creativity flourished, and her entrepreneurial spirit shone its brightest all while juggling what some might consider impossible. For this, I’m so incredibly inspired by her! I’ve taken an uncountable amount of maternity portraits in my many years as a photographer, but never had the opportunity to photograph someone’s entire pregnancy journey from start to finish. Amidst all the crazy and impossible weather forecasts and career traveling, and juggling of children; we managed to find regular times to connect… not only by taking portraits, but also by checking in on one another’s personal well being. Pregnancy is such a raw vulnerable time, its vital to create time for self check ins! What is most important about portrait photography to me is CONNECTION!!! It’s not about just taking a picture of someone, its about KNOWING and UNDERSTANDING each person who steps in front of my camera well enough that they reveal who they are to me. To me that’s the difference between a “picture” and a “portrait”. The relationship I formed with Emma extended well beyond simple portrait taking and has turned into a lifelong connection that I feel so grateful for. When I began piecing these portraits together to form the time lapse video, I became a puddle of tears on the couch. Witnessing her journey firsthand has been such a complete honor and privilege to me. We chose two of the poses from the Studio Portrait sessions. So here it goes! 9 months in 35 seconds (x2) I’m not sure that a 35 second video can even begin to sum up the fullness of the journey…but it gives a powerful glimpse into the super human power that is called MOTHERHOOD. The capability of a woman’s body, mind and spirit to stretch, expand and release throughout pregnancy is incredible to me. Each woman has their own unique journey that brings them to motherhood. You can read Emma’s personal birth story and journey here. Music credit for these videos goes to Ms. SASHA ROSE whose music has continuously inspired me over the years to walk a path of self love. This is the song “Womb of the Earth” on her album “Creation Song”. I have never seen such an angelic looking child before as Cora Jill. She is flawless. Thank you for sharing this.